Home / TallyERP.9 Lessons / How to Create Bank Entry (Contra, Payment, Receipt) in Tally? How to Create Bank Entry (Contra, Payment, Receipt) in Tally? At Tally Knowledge, you can easily learn lots of stuffs. Now we received too much request to provide voucher wise entry for beginners. In this post, we learn about all type of Banking Transactions. First you have to know how much Bank Entry will be create or can be done in Tally. Contra Entry is used for withdrawal cash from Bank or Deposit cash in Bank. Through Contra entry you can also able to print Deposit Slips to deposit cash in Bank. This entry will reduce cash and increase your bank balance due to deposit of cash in Bank. If note denomination is wrong then difference will appear at bottom of the table. On other hand, you can pass reverse entry for withdraw cash from Bank. Payment entry is use to make payments for Expenses, to parties, to banks, for financial payments etc. Payment voucher also to be used for withdraw cash from Banks like contra entry. In payment voucher default system is not allowed you to enter cash ledger in payment voucher for use this press F12 and select yes to Feature "Use payment / receipt as contra Voucher". I have purchase some stock from Party A for Rs. 50000 then i will use payment voucher to settle the account of Party A. Specify Cheque number in narration. You can also make payment bill wise to any party. Similarly if you want to withdraw cash from Payment voucher then Dr. Cash and Cr. Bank. Receipt Entry is use to receive payment from party, Interest from Bank, Neft Credit, etc. You can receipt voucher also to deposit cash in Bank, but receipt voucher not print deposit slip as printed by Contra Entry. You can also select multiple transaction type in receipt voucher suppose if a Party Direct transfer amount in your bank through NEFT or Online transfer then you can enter the details as per Bank Transaction nature. On the screen of Bank Allocation you have find some options like ATM, Cash, Card, Cheque, ECS, E-Fund Transfer, Electronic Cheque, Electronic DD/PO and Others. You need to specify the nature of transaction from the list (for information see below image). 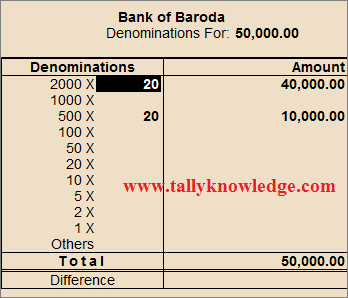 Bank Allocation feature is very useful for Bank Reconciliation. If one wants immediate access to the full amount of their deposited check, one must usually cash that check at the issuing (payor) bank and then deposit the cash into their own account.